Some mashups of words on my work. Similarly defying pigeonholes is Christopher Patton, who has optically transformed his handwriting into a series of abstract images, made into a video loop. Is the resulting projection a movie, or a scanned drawing? What’s of interest here is the way his chance process has transformed ordinary cursive writing into highly evocative blobs and squiggles, suggestive of faces and pictographs, with the occasional legible fragment here and there. Most communication is, at heart, nonverbal; Patton is working at excavating the emotional subtext behind his writing – a daily account of his car[e] for his aging father. Oxen – those deep-thinking brothers and sisters of cattle – keep their faces close to the ground most of the time. So does Christopher Patton. It’s an excellent posture for munching the grass and an excellent posture for poetry. Here’s a voice that is eyeball-to-eyeball with all that we stand on. Ox is artful, intelligent and substantial, a refreshing and generous first book from a very steady-eyed, steady-handed, steady-minded new poet. Though decorously undecorated, Patton’s poetry is carefully constructed. He begins with the usual physical world then segues out into the realm of a zenful consideration. In one of the poems, red maple flowers become the residual red paper confetti of an inauguration. In another, a weeping willow becomes anthropomorphized into a disheveled queen searching haltingly through her sorrows to tell her tale to her chastened, emerging buds. Patton circles and hovers over the existential profundity of human passion. Ox is a first-rate first book from a steady-voiced, capable new poet. Even the few houses and streets that appear seem strangely transformed into wild places. The first section draws us into an interstitial, deeply unsettling world between tree observed and person become tree, as if in mid-metamorphosis one could stop and function with both human and vegetable consciousness. We slip through time, geologic to microscopic, without missing a beat. People elide into wood and leaf with dizzying simplicity. Patton’s language play leavens his sometimes stormy visions. He’ll game a word so it pings throughout a poem. His musicality and sense of structure are impeccable. “Weed Flower Mind,” a long poem set in a Zen monastery in upstate New York, steers us through the days there in numbered block-like stanzas. As brick after brick of text is laid, the narrator’s mind rebels, his body rebels, his senses and emotions run riot. Mother, father, lovers, all appear, disturbing the peace. And by the closing we hear of a quiet small victory. “Each stone a path. We are not our own.” Ox is a terrific first book from a sophisticated and sure-handed young poet. The movement of thought is trickily elliptical, with abrupt shifts between present and past, observation and contemplation, “personal” references that remain deliberately opaque, and quick and subtle wordplay. Moving through the long last poem is like moving through an overgrown garden or through the thickets of the self; the poem’s texture and its difficulties beautifully embody its dominant concerns. Some here remind me of Marianne Moore’s in their finely detailed observations of the natural world, their intricate stanza forms and syntax, their subtle use of unstressed rhyme and half-rhyme, and their striking enjambments. “White Pine” in particular has a Moorish ethical critique of the Western desire to dominate and appropriate the natural world (contrasted here, as in Moore’s “Virginia Britannia,” to the ethos of Native North Americans). I’m not quite sure what to make of this poem’s close approximation of Moore, but it’s about as good as Moore at her considerable best. The poems titled for trees are as lovely as anything I’ve read in recent years. Patton has taken care to observe the trees as biological entities, and before they are vehicles of allegory, they are entirely themselves. From trees we move to poems about human alliances and relationships. The voice here is restrained and formal but the material is intimate: a son mourning a mother’s inattention, the loss of a lover, the anguish of a soul in extreme pain. And I loved the poems in the voice of Pliny the Elder. Phrases from his Natural History are woven through as a richly resonant homage to that quirky observer of natural and human affairs. Patton concludes a kind of daybook chronicling time at a Zen monastery. From the desolation of the third stanza, through a difficult attempt to reconcile with a host of visitants, a father, a lover, ghosts of the past, the poet arrives at a semblance of peace. This poem is beautifully-wrought, full of physicality, the stanzas fitting together like the flags the poet sets and tests: “Each stone a path. We are not our own.” A collection of great originality. I’ll confess to being somewhat dumbfounded by the general excellence of Patton’s poetry. It is like a tart yet euphonious field guide, from whose pages we want to look up with eyes more informed. Patton seems immune to haste, although there is sufficient evidence of improvisation to enliven his testimonies. Patton is, paradoxically, a cultivator of wilderness. He does not tame the objects of his attention. Rather, his cultivation is always after the fact – sensuously he harvests what we cannot practically harvest, without resorting to a pernicious idealism. It is as if he were so soaked in botany that a vegetable slowness, not sloth but care, accompanied the registration of even the most ephemeral of phenomena, leaves and flowers. Patton addresses himself to nature without resorting to banter, and draws on Eastern philosophical traditions without the slack prosody that often accompanies the incorporation of these traditions into North American poetry. The natural world is both impromptu and organized – otherwise it would not survive. Patton’s work exhibits these features praiseworthily. 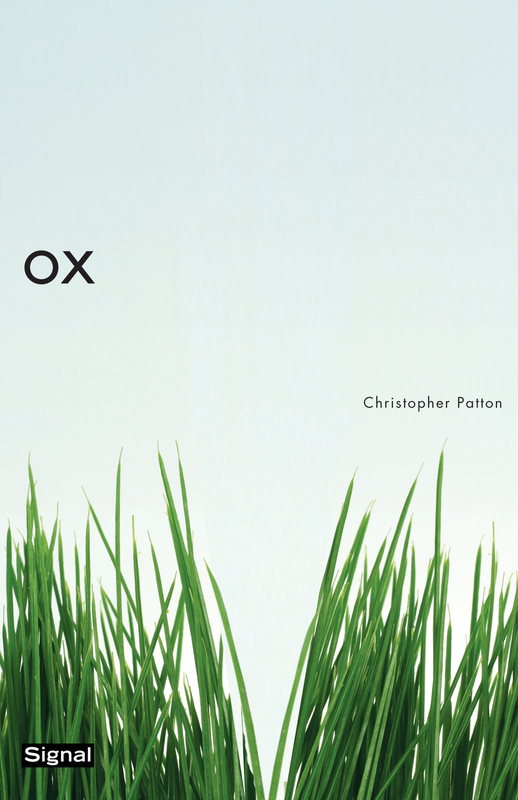 Christopher Patton’s Ox has an ecological emphasis that demonstrates the importance of acknowledging the multiple, ethical connections between the natural environment and human society. Through unique examinations of the flora and fauna that inhabit the spaces of daily interaction, he illustrates the multiple narratives that intersect through time and across lives. The poems are finely-wrought paintings, nuanced observations of both elemental and human nature. Patton’s insightful connections between individual human life and communal ecology are shown in his depiction of trees as both witnesses to and participants in human settlement and history, and in his reflections on the pastoral as genre, aesthetic, and problematic romanticization. The problem with this variety of poetry is that it is often beautiful but emotionally vacant. The poems leap off the page with their ecstatic longing for communion with nature, and they seem divined to view the most minute details and report back with verbal acumen. Not, as the book cover suggests, a whole new scale of Canadian nature poetry, but rooted in it, and in Gerald Manley Hopkins, and in the American school of quietude. But what is it about? What moves below the surface of the ear? What depths does the poet plumb? “A seed is a sound,” a poem begins, beautiful alliteration, a whisper over ice, over seed pod, rattle of fall, a few flashes of wind. But nothing transforms, nothing after the first line surprises. A carafe is a blind glass. That’s a new scale. Still, this is lush poetry, an absolute pleasure to read. Beautiful syllables rolling on the tongue, very fresh. Though it doesn’t leave us shaking in newness. I’m making much of this because I think presses should be held accountable for their blurbs. Yet it isn’t the poet’s fault his work is being spun a particular way. His work is doing this – this sound, this line, this beauty. Line after line of it, a delight to the ear, just gorgeous. Not leaping off into a new way of thinking, no, not quite new, but lovely. Another impressive debut. One you must check out. There is very little to hold on to in these poems. You don’t gain a greater understanding of yourself or the world. You don’t come away feeling cheaply enlightened. What you come away with is an experience, the feeling that you’ve been through something, something more physical than mental. You learn of concentration, the poet’s and your own. The language of Ox is a tangle of words and sounds, its phrases are deeply nested, opening up into one more possessive, one more subordinate clause, one more adjective before the next subject, the next matted clause. And while the poems are full of human beings, settlers, soldiers and scholars, to whom the wood lends life and through whom it acquires a kind of history, they are barely noticeable as wilful, subjective actors. They appear more as wispy veins of a maple leaf or barks off a trunk. You can never be sure whether he is referring to the thing or to the person – the animate and inanimate are interchangeable here, shot through with each other. Nature does not stand in for us here. Nor is it set apart from culture or human-made objects. Things just are as they are. Instead of outlining the hollow of human anxiety and then filling it with pre-made, tilled responses, Patton waits to see if the world has anything to say about itself. And it turns out it does: the world says things in the earthy, tangled language of an untended shrub, fractal but sensible, messy but luscious. Here is a poetry which demands (and rewards) an attention we may not know we “had.” The compensations are as generous as the scruples are insistent. Yield to the rigour and it will reward you with a kind of ease not available elsewhere: there are no further pains to be taken here, only delight and a semi-botanical perlustration. Your best bet is to find a translator who works in that rare middle ground – a scholar gifted with a poet’s ear and sense of line, or a poet with a scholar’s interest in faithful rendering. Patton finds that balance. His approach clearly gives lyricism high importance, but he never sacrifices clarity or readability. He wisely turns the separated, double two-stress line of Anglo-Saxon poetry into a standard iambic tetrameter, which he handles with maturity. In his tone, I think he has achieved something similar to Lattimore’s translations of Greek, a voice that manages to sound epic and dignified like the original without sounding archaic or stilted. Patton’s translations leave the pathos intact. They make us feel that these speakers are us. I think they have the potential to become the definitive modern translations of these poems. Patton’s Curious Masonry, done well in every way, lends itself to reading and re-reading. 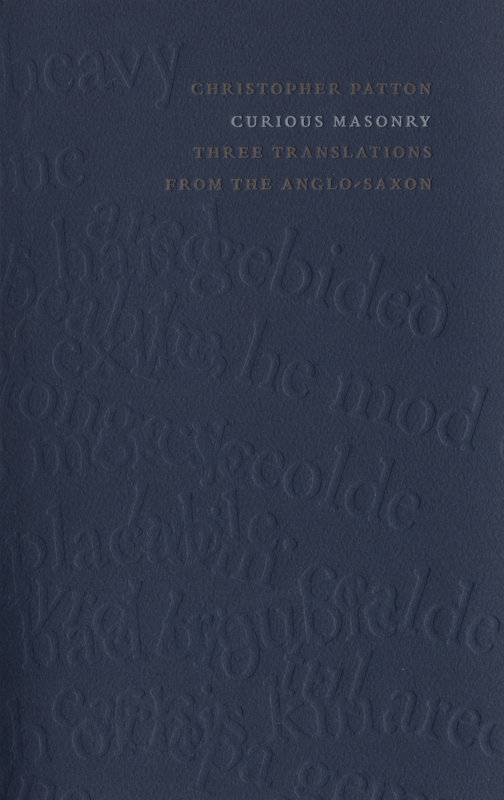 This book will not encourage readers who are curious about how the original Old English might have sounded, for it fails to provide discussion of allophonic variants and directions for reversing the Great Vowel Shift. It will not encourage budding translators, for it obscures all the real problems – manuscript conditions, necessary emendations, dialectal variations – and fails to provide a grammar and a glossary. Because it lacks an essay on the poems’ cultural/historical context (for example, the lord-retainer relationship, the ubi sunt echoes, the goals of Anglo-Saxon seafaring, the association of the ruins with Roman occupation), and does not encourage further reading by providing a bibliography of interpretative scholarship, it does not cultivate reader curiosity about the original audience who heard these poems recited and the literary traditions of the place and period that produced them. Instead, it invites the casual reader to provide his own interpretations, out of his own life experiences, and then tricks him into believing that he has understood what he has read. the Alcuin Society Book Design Awards. A gorgeous object in itself, with deep blue cover blind-printed with phrases of text, this is small press production at its finest. Patton has offered versions of three poems from the Exeter Book, the 10th c. codex: “The Earthwalker” (often translated as “The Wanderer”), “The Seafarer,” and “The Ruin.” Going deeply into the heart of these magnificent texts, Patton provides us with durable poems for our own troubled times. Interested readers should also seek out the glorious Anhaga, the late Jon Furberg’s own retelling of “The Wanderer,” recently reissued by Arsenal Pulp Press. 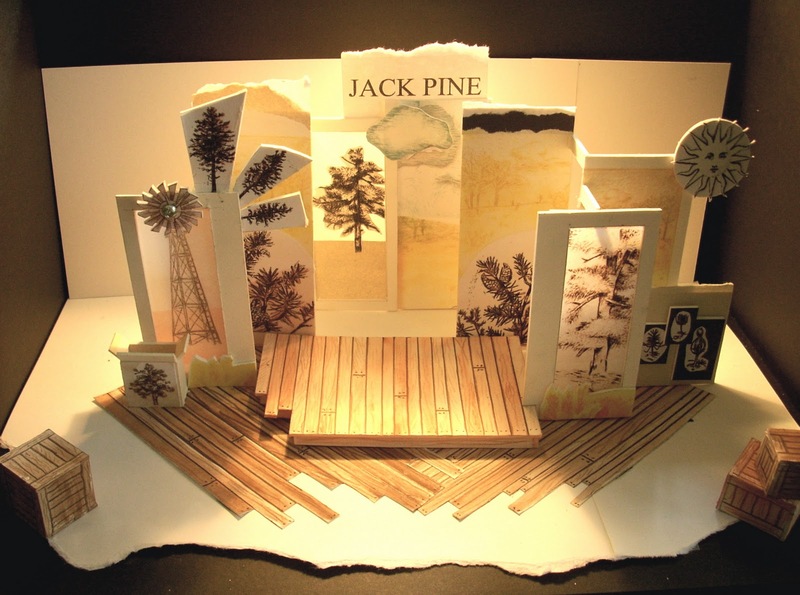 Christopher Patton’s Jack Pine is both informative and imaginative as it teaches children about the natural world. The author sympathetically portrays the pine’s role in the ecosystem and represents the history of human misunderstandings about it by focusing on one fictional, though realistic case in which a farmer blames the pine for the poor soil quality and even for the death of his cattle. The pine is seen as useless and even harmful by humans, while the ecosystem, including the other varieties of pine, benefits from its sheltering qualities and its hardiness. Each type of pine in the poem is given its own voice, so that the poem is told from many perspectives. The author also provides a brief one-page history of the pines featured in the poem for the curious child – aged from six upwards – who might want to know more. The connection between all different aspects of animal and plant life is constantly evoked by the collage illustrations. The technique of printing photographs of Cybèle Young’s etchings and subtle watercolours, rather than printing them directly on the page makes them tactile and immediate. as one of the ten best children’s books of the year. He’s vilified, unfairly, as the poisoner of a farmer’s field, the cause of the barren soil over which he presides. They sprout. Eight new Jack Pines are born. There’s a fine and pleasing symmetry here between the plain-spoken but ultimately eloquent verse and the unlovable tree and its ultimate nobility. and toured across British Columbia and in Ontario. This is a mockup of the stage set. Judging from this anthology, Canada’s younger generation are more than just promising. Starnino has chosen poems and poets with real sureness of voice, technical inventiveness and a broad range of themes and forms. One poet who works in longer forms is Christopher Patton. On this showing, his work will become indispensable, and he is one of the book’s revelations. 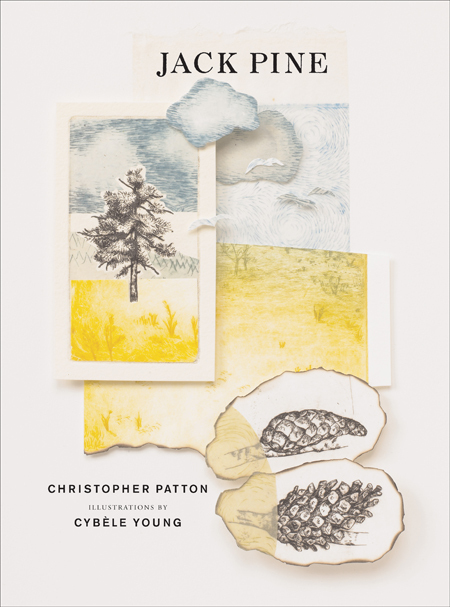 Christopher Patton brings a Zen power of clear-seeing to his poems along with a formal style reminiscent of Marianne Moore’s syllabic verse. The pleasure of reading Patton’s language is so great that it’s easy at first to miss the subtle spirituality of what he is doing; that is, until he springs it on us, often at the end of a poem, often with a phrase that recalls the Zen masters, and then the significance of what we have been reading is suddenly clear.